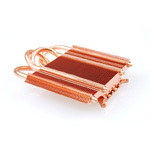 Thermalright is well known for their GPU and CPU coolers. They have put out some of the best coolers such as the HR-03 VGA cooler, and the Ultra 120 CPU cooler. We just recently took a look at their HR-11 VGA backside cooler that is designed to give you additional cooling with a stock or after market cooler. Today we are going to take a look at their V2 VGA cooler. The V2 comes in the passive form and allows the consumer to mate the proper 80mm cooling fan with it that best suits the users needs. Good review Tazz. Thought you gave it a little too high of score but thats just myopinion. Hmmm, I'm not impressed at all with that setup. Seems to bulky and it seems like there are better coolers out there that are smaller. Aren't there some that will exhaust the hot air to the outside of the case as well? I knew that was coming . Well if the product does everything it is suppose to (holds up to its designed specs and performance), I feel it would get a perfect score of 10. So before I receive a product it actually has a shot at getting that perfect score. Once I start using the said product I start noting any issues I have with it. Once all is said and done I score it out based on negative issues I found. The V2 coolers produced two main issues for me. The passive cooling wasn't quite up to snuff on the tested cards and the overall height of the cooler/card/fan combo. The only other issue was the fact that if the cooler was securely fastened to the card (tighter than hand tight) it would bow the card a little bit. This issue is something that I have seen in every after market cooler I have installed, so it's nothing new and is relatively easy to deal with. So I docked the card 1 point for the passive cooling. The size could be a major concern to some while not being an issue to others like me. I don't run a slew of cards in my rigs, just the vids and the occasional wire-less cards. I then looked at the cards performance numbers wise. I had achieved a 20+% improvement with the the V2's installed w/fans over the stock coolers. So I decided to dock it 1 point for the bowing/size issue and proceeded. I know guys that will drop 50 bucks on a cooler just to get a couple of degree drop in temps. Overall I do feel the V2's did really well producing a 20+% decrease in temperatures. The reason I wasn't to hard on the passive cooling is because I don't feel the ol 7900's are a good card to use on that comparison. I don't think you will find to many people pushing the 7900GS for an HTPC setup. Most will dive into the 8500/8600 or HD2600 cards for an HTPC setup and the V2 in a single card setup with one of those I am sure will produce acceptable temps (better than what my 7900's show).